Happy Canadian Thanksgiving!! The holiday usually comes with an over-indulgence hashtag, so in contrast, the cake was a study in decadent minimalism. From it's trio of hand-crafted, golden fondant pumpkins, to it's cascading, chocolate ganache, this cake couldn't quite make up it's mind whether it was simple-and-chic or gloriously-decadent! Four layers of rich chocolate cake paired with espresso buttercream, fudge swirls and creamy ganache...Mmmmmm...you decide. Let's be honest though, after the turkey, the stuffing, the sides and the gravy, who even has room for dessert, right?! 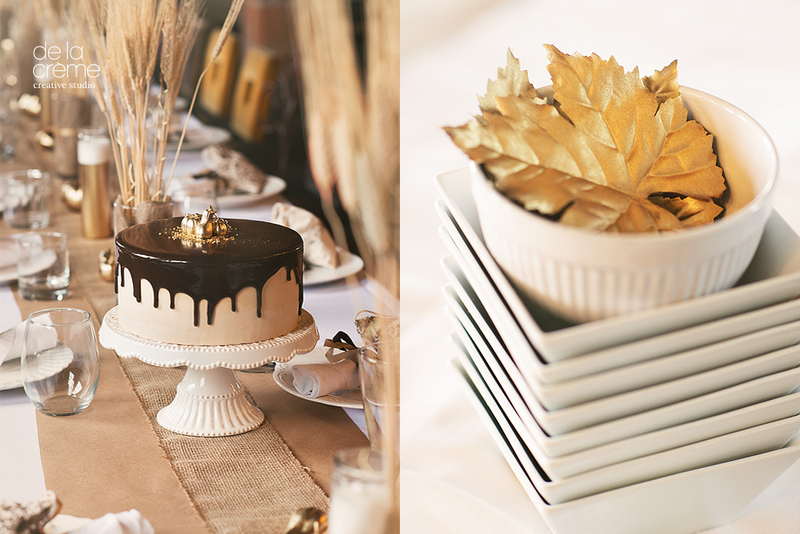 Either way it was the perfect compliment to the beautiful decor and tablescape created by Tyson Dale Baker.